One of the remarkable features of the Soviet era was the desire for a healthy lifestyle. He was promoted through loud slogans, television, public meetings and, of course, through propaganda posters. It was a whole world that reflected the essence and meaning of the Soviet government, which wanted to bring the country to the highest level. Posters agitated people not to drink, lead a healthy lifestyle and, of course, go in for sports. Thus, the series “Ready for Labor and Defense” was created. On January 17, 1972, a decree was created which contained a number of norms. They indicated that a Soviet citizen should be a strong, athletic man. For success in the TRP even gave badges that could be both silver and gold. 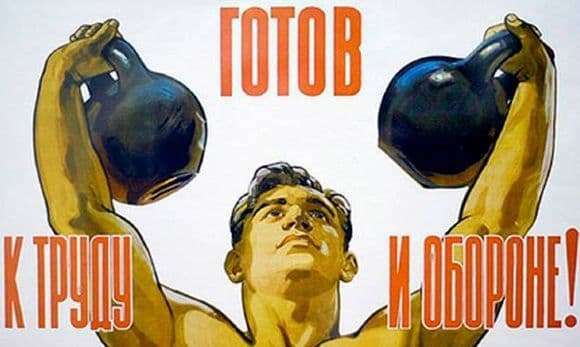 Almost all citizens could participate in the Soviet program, since people aged from 10 to 60 could participate in a kind of competition with themselves. The labor and defense program provided for a very serious set of activities that made a person physically very strong. Getting the badge was not so easy. For example, it was necessary for a certain time to run a distance, to make jumps from the tower, to throw the load farthest. Most citizens sought to comply with the TRP program. Nowadays, a healthy lifestyle is also becoming relevant and fashionable. More and more young people try to play sports, refuse alcohol and smoking. Dynamics to a healthy lifestyle becomes better when compared with the past 90s. Of course, in our high-tech age, the relevance of the “Ready for Labor Defense” type posters could also be the place to be. After all, many would like to look proud. Russian people have always been very strong and strong. And we have something to learn from the Soviet people.